GREENBELT, Md. – NASA’s Goddard Space Flight Center and The University of Colorado’s Laboratory for Atmospheric and Space Physics (LASP) announced the formation of a new collaborative research center dedicated to the study of the Sun’s effect on Earth’s climate. The center, called the Sun-Climate Research Center (SCRC), will be directed by Robert Cahalan, Head of Goddard’s Climate and Radiation Branch, Douglas Rabin, Head of Goddard’s Solar Physics Laboratory, and Peter Pilewskie, a LASP research scientist and CU professor. 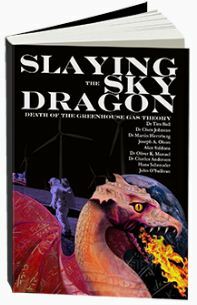 John ‘o’ Sullivan recently posted on Judith Curry’s site to let us know he and 23 co-authors have a book out called ‘Slaying the Sky Dragon‘ which takes on various aspects of the AGW hypothesis. In the second volume Mišo Alkalaj claims to debunk the attribution of half the rise in co2 to fossil fuel burning. The effect of the Galactic Cosmic Ray (GCR) flux on Earth’s climate is highly uncertain. Using a novel sampling approach based around observing periods of significant cloud changes, a statistically robust relationship is identified between short-term GCR flux changes and the most rapid mid-latitude (60°–30° N/S) cloud decreases operating over daily timescales; this signal is verified in surface level air temperature (SLAT) reanalysis data. A General Circulation Model (GCM) experiment is used to test the causal relationship of the observed cloud changes to the detected SLAT anomalies. Results indicate that the anomalous cloud changes were responsible for producing the observed SLAT changes, implying that if there is a causal relationship between significant decreases in the rate of GCR flux (~0.79 GU, where GU denotes a change of 1% of the 11-year solar cycle amplitude in four days) and decreases in cloud cover (~1.9 CU, where CU denotes a change of 1% cloud cover in four days), an increase in SLAT (~0.05 KU, where KU denotes a temperature change of 1 K in four days) can be expected. The influence of GCRs is clearly distinguishable from changes in solar irradiance and the interplanetary magnetic field. However, the results of the GCM experiment are found to be somewhat limited by the ability of the model to successfully reproduce observed cloud cover. These results provide perhaps the most compelling evidence presented thus far of a GCR-climate relationship. From this analysis we conclude that a GCR-climate relationship is governed by both short-term GCR changes and internal atmospheric precursor conditions. Leif offered us a graph of ‘Dst’ which is a measurement of earth’s horizontal magnetic field – in the plane of the orbits of the solar system’s planets. fundamental measure of magnetic-storm intensity. 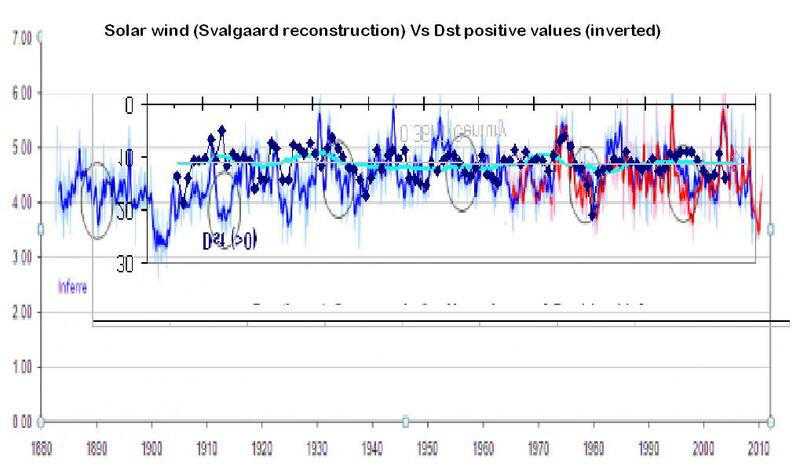 Eyeballing this graph I noticed that the positive and negative components of the Dst index when inverted would correlate quite well with Leif Svalgaard’s solar wind reconstructions and the sunspot record. This may or may not be a novel discovery. I don’t yet know if anyone has spotted it before. Vuk is busy working on this data too, so I hope he calls by with his opinion. He attaches a suitable health warning. I would like to make it clear at the outset, it does not appear that correlation is ‘effective’, since signal so obtained does not possess the required energy. Of course I could be wrong, but for time being it is just an interesting, let’s call it coincidence. Wordpress’ Gif image reduction is a bit crunchy so click on image to open full size. Kevin, that’s an interesting point. When I posted on Real Climate pointing out the glaring error in the optical physics used in most if not all the climate models to predict cloud albedo from optical depth**, my post was taken down in less than a minute. **Mie solved Maxwell’s equations for a plane wave so the assumption of constant ‘Mie asymmetry factor’ is correct only when light first enters a cloud. Also, substantial direct backscattering at the upper cloud boundary is ignored yet it has an opposite dependence on droplet size than diffuse scattering. Therefore, above a threshold ‘optical depth’, pollution causes a reduction of albedo, another form of AGW. So, at the very least, the IPCC’s predictions of CO2-AGW should be reduced by a factor of about three, possibly much more if ‘cloud albedo effect’ heating explains most recent warming. “Reducing the size of the temperature gradient through the skin layer reduces the flux” [of energy from the ocean to the atmosphere]. You don’t seem to have a handle on the type of complexity we are dealing with here. Hint, check out where the heat comes from. It only seems to be complex from the point of view of proponents of the co2 driven global warming hypothesis because they have to do complex contortions to try to make it seem like the energy is coming from the atmosphere and heating the ocean. It’s actually pretty simple and the other way round. the energy is coming from the sun, into the ocean which then emits energy into the atmosphere which causes the atmosphere to warm. On her blog Climate Etc, Judith Curry has said she is considering putting up a post where skeptics will get 750 words each “to give it their best shot”. This doesn’t give us long, so I’ve decided to get started early with my submission. Hopefully, the contributors here will be able to provide some helpful criticism and help me hone and sharpen this further. I’m currently 243 words over the limit, so suggestions on what I could chop out without losing meaning would be great. How true. 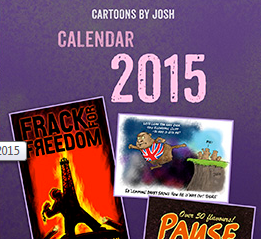 I’ve been busy on two other blogs recently. Judith Curry’s ‘Climate Etc’, has been exploring IPCC Dogma, the war between AGW advocates and sceptics, and Ideologues. This latest thread looks at some of Mann’s pronouncements and examines the question of the etent to which it is science, and the extent to which it is ideology. 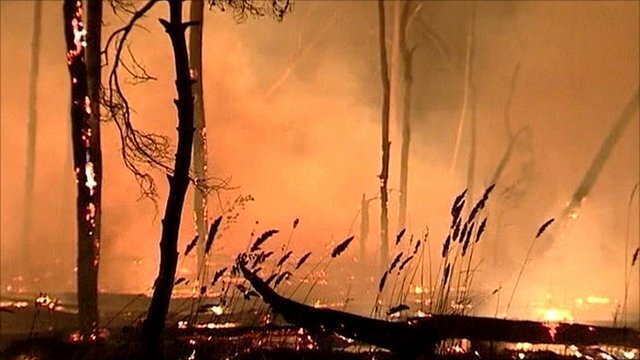 The other blog I’ve been firefighting on is Science of Doom. S.o.D. visited here a while ago and joined in the debate on the John Nicol thread. Prior to that, I’d had a discussion with S.o.D. regarding the (in)ability of back radiation to heat the ocean. A subject taken up at the S.o.D. blog since.